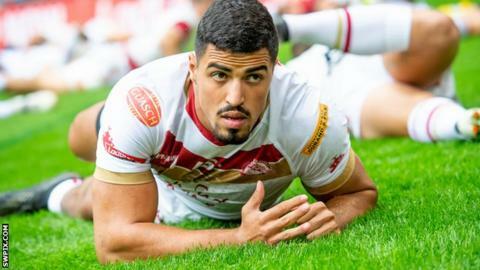 Catalans Dragons have re-signed winger Fouad Yaha, just five months after he left the Super League club to play for Top 14 rugby union team Agen. Yaha, 22, scored 32 tries in 62 Super League games for the Dragons, and was a 2018 Challenge Cup winner. He made four appearances in the 15-man code, scoring two tries in the European Challenge Cup. "My experience at Agen in rugby union is positive," Yaha said on his return to the Perpignan-based Dragons. "But my love for my sport was too strong and I'm delighted to be back to the club where I started my career." Head coach Steve McNamara added: "Fouad's return will be a great addition to the squad. He left the team on great terms and is extremely popular within the playing group."